The Willies (1990) Review – AiPT! Those bargain bins of cheap, under $10 DVDs are a terrifying gamble. Sometimes you emerge with enjoyable garbage like “The Legend of Boggy Creek”. And sometimes you emerge with cinematic refuse best left buried at the very bottom, like “The Chilling”. Or, in this case, a 1990 straight-to-video anthology horror flick for preteens called The Willies. While it won’t actually succeed in giving you “the willies”, it may just give you a brain tumor. Three juveniles (Sean Astin, Jason Horst and Joshua Miller) are having a camping trip in their backyard, so that means spooky stories. But rather than trade tired old ghost tales, they opt for supernatural urban legends of the “heard from a friend of a friend” variety. Also, vague references to The Goonies because it wants to remind you that Sean Astin has been in better movies. The movie opens with a trio of short vignettes meant more to gross you out than frighten you. The first one involves a fat woman accidentally eating a deep fried rat at a chicken restaurant. The second is a spoof on the old urban legend about Disney’s Haunted Mansion, involving a geriatric who is so scared by the ride he has a heart attack, resulting in the owners making the ride “wussier” for the public. 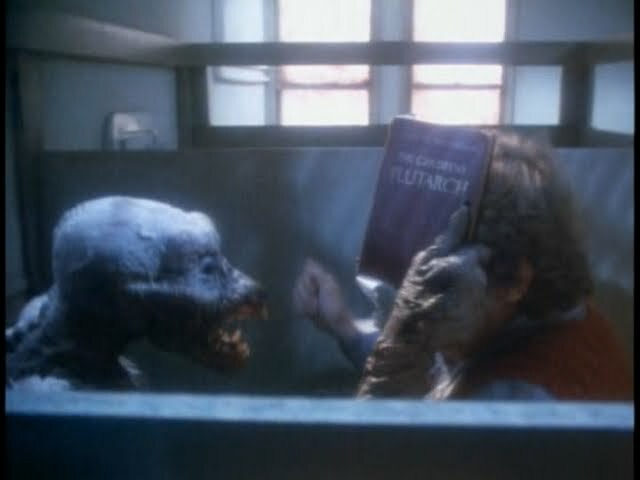 The third sees an old lady bathing her poodle and trying to dry him off in the microwave, which naturally causes the dog to explode like it had just eaten a hand grenade. The vignettes set the extremely juvenile tone that The Willies goes with, being less concerned with scaring the audience than making them lose their lunch. Rated PG-13, you’ll notice most prominently in these vignettes that despite some of the violence, there’s no blood. Or no red blood, that is. A woman gets her throat cut and the wound squirts green slime in the second segment. While in the third, the poodle explodes, leaving globs of orange and brown goo everywhere. I’d call this “stupid”, but that might be missing the point. This movie seems pretty proud of its stupidity and wears it on its sleeve. Following the vignettes, we get two stories that seem meant to be both funny and scary but succeed in neither department. The first involves a nerdy elementary school kid (Ian Fried) being picked on by three classmates as well as his own teacher. After encountering a horrifying monster in the boy’s restroom, he uses the opportunity to get revenge on the people who bullied him. Probably the “best” of the stories; I rather liked the goofy-looking monster. The story seemed like something traditional-enough to have read a variation of in one of those cheap paperbacks of ghost stories you could find at elementary school book fairs. But like the rest of the movie, it suffers from god awful acting on the part of the children, whom you just want to strangle. Character actress Kathleen Freeman plays the evil teacher and, along with James Karen as the janitor, is probably the best talent in the film. The final story is going to tax your endurance. An overweight kid with a bad attitude (Michael Bower) has a strange and morbid hobby: he likes to collect dead flies. Unfortunately, his desire to attract flies leads him to steal a special, unstable new fertilizer from a neighbor’s farm. There is an actual I-kid-you-not crossover with the cast and set of “Growing Pains”, followed by three giant fly monsters that proceed to eat the fatso’s arms off. Anyway, Michael Bower (you might remember him as Donkeylips from Salute Your Shorts) is pretty obnoxious in this one, but his character is supposed to be. One of those “his comeuppance is going to feel real satisfying” sort of deals for the audience. Unfortunately, the segment just wanes on and on and on as you watch this brat for what feels like an eternity, just waiting for him to get his just desserts and end this stupid flick. It’s an especially lackluster way to end the movie, as the previous segment featured quite a bit of monster footage as the creature in the bathroom tormented the kid through the whole duration of the story. This one takes the more traditional route of trying to build toward the twist, but as it keeps compounding more and more reasons to hate the kid, your patience just might not make it to the conclusion. And naturally, the move ends with the campers finding out one of the yarns they spun was true, and Director Brian Peck does his level best to telegraph it as obviously as possible. Honestly, I don’t have a problem with horror movies aimed towards kids. The Gate is a favorite of mine and I dig The Monster Squad when I’m in the right mood. But The Willies is just a cheap, badly acted, badly written and badly made horror movie that’s too immature for even the 12 year-olds it was geared for. And hey, nothing says “quality” quite like the reflection of a boom mic in a window.